People First: The Assembly - what are voting for? The Scottish Parliament building - Our Big Sister? 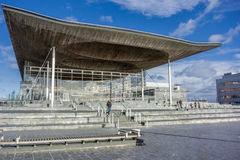 The National Assembly has been sitting in Cardiff since 1999. It has 60 members, 40 of which are elected on the first past the post system and 20 of which are list members elected by the Regions with the second vote. This part of the election uses a form of proportional representation which divided the votes of the parties by the number of seats they already have, giving smaller parties more of an advantage to balance things up. The Welsh Assembly is popular. Polls have consistently shown that people generally like it and are supportive of more powers for the Sennedd. Even UKIP, who had campaigned for the abolition of the Assembly until September 2013, threw in the towel and are now desperate to put its members into seats in Cardiff Bay. It is responsible for Health, Education, Agriculture, Environment, Local Government, Business Policy, Culture etc., all the functions of the old UK Welsh Office. It is funded by UK Taxpayers using the “Barnett Formula”, a deal which gives it a fixed income. It has limited opportunity to get any more money through taxes and fees etc., even with the more recent extra powers. We have been successful in some fields. Free prescriptions for all, free bus passes for the elderly and disabled, an opt-out organ donation system, no smoking in public places etc. We are good at the single issue options. Unfortunately I would argue that we have not been so good at the larger challenges. Health, Education, Environment, Transport infrastructure, Housing, Social Justice and public services in general have not turned out entirely as promised. In the beginning the problems were variously attributed to internal difficulties. The Assembly civil servants were sourced from the Welsh Office where apparently those who couldn’t cut it in Whitehall were sent to “do no harm.”. Surprisingly they then had to set up a new government for Wales. Money was wasted on useless computer systems .Many projects failed to get off the drawing board. Reorganisation of Health Authorities and Local Government had already been set in motion and the new government couldn't stop the reorganisation of the NHS. Many of the new elected members seemed ill-prepared for government. The suggestion was that most parties were fielding the “B” teams, those not good enough to be put up for MP posts given a consolation prize with good money and prestige. Others believe the problem is too little money to really improve the prospects of our country. Wales got less cash per head than Scotland did. Scotland also had real roads and a better NHS before devolution. I know, I used to live and work there. Wales inherited chronic under-funding of public services and national infrastructure. The only efficient new north south transport route for our country is the subsidised “Ieuan Air” flights from Cardiff to North wales which are hardly suitable for mass public use. You can hardly pretend to be a proper country when getting from A to B is so difficult. Cardiff has benefited greatly from the Welsh Government being based there and is a prosperous city. The rest of Wales has not done so well and Mid and West Wales are still practically in recession. Our Health and Social Services are being relentlessly eroded, the weather patterns threaten us much more on the West than the East and plans to maintain or improve local industries, healthcare and services are sadly lacking. The campaign itself is muddied by slagging off one side or another over actually offering anything yourself. There will be vague promises of big improvements, great leaps forward and a stronger better government. The unspoken questions about why the current government forgot to do all this last time will be swept under the rug in the pomp and performance of campaigning. They cloud empty declarations behind scripted trash-talking, treating the governing of a country like a sport to be won or lost. When you support a sporting team you cheer for the player wearing the shirt out of loyalty, even if you know that individual is rubbish. Voting for your government is not a game, it is real life with real consequences. All of the parties in power in the Assembly so far have let us down. Under performance has become a bad habit. People First is a different sort of party. It was formed as a Welsh party to represent you, the people who live here, and no-one else. We accept that different parts of Wales need different things and face different challenges. One size does not and should not fit all. The inhabitants of are as deserving of a better, fairer, competent government as anyone else!